Four Corners Steam Plant is a coal-fired power station owned and operated by Arizona Public Service Company near Fruitland, New Mexico. The station consists of five units, and the three oldest were retired in 2013. One of the largest coal-fired generating stations in the United States, Four Corners is located on Navajo land in Fruitland, New Mexico. The plant’s two active units generate 1636 megawatts of electricity and are operated by Arizona Public Service Company, which serves about 300,000 homes in New Mexico, Arizona, California, and Texas. According to the American Lung Association, the following people in San Juan County are at elevated risk from power plant pollution: 2,885 people with pediatric asthma, 8,442 with adult asthma, 5,219 with COPD, 9,418 with diabetes, 6,607 with cardiovascular disease, 15,612 who are 65 and older, and 27,265 with low incomes. The ALA states that although "[d]angerous levels of air pollution can harm everyone, even healthy adults," those in high-risk categories are particularly vulnerable. The plant utilizes scrubber technology to reduce sulfur dioxide and were installed in the 1960s. The San Juan Generating Station is nearby, in Farmington, New Mexico. The 1800 megawatt plant emits approximately 100 million pounds of sulfur dioxide, 100 million pounds of nitrogen oxides, 6 million pounds of soot, and at least 1000 pounds of mercury per year. 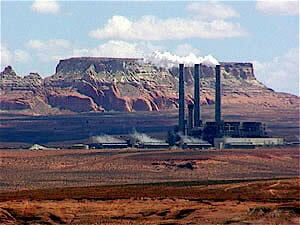 The proposed Desert Rock coal plant is within a 20 mile radius of the Four Corners and San Juan plants. Coal combustion waste from the mines supporting the Four Corners and San Juan plants has contaminated local groundwater with sulfates, leading to the death of livestock. According to one source, 70 million tons of coal waste (containing cadmium, selenium, arsenic, and lead) has been dumped in the Navajo Mine, and combined with the San Juan mine, amounts to a total of 150 million tons. On February 18, 2010, a coalition of environmental groups petitioned the U.S. Department of Interior and Department of Agriculture to declare the Four Corners plant in violation of the Clean Air Act and require reduced pollution. The petitioners (including Earthjustice, the Sierra Club, the San Juan Citizens Alliance, the Center for Biological Diversity, Dooda Desert Rock, Diné CARE, WildEarth Guardians and the Grand Canyon Trust) note that the plant is the largest source of air pollution in New Mexico and is less than 200 miles from 16 national parks and wilderness areas. In December 2013 APS closed three of the oldest coal units (built 1963-4) at Four Corners to comply with EPA regulations, but will keep Units 4 and 5 opened (built in 1969-70). On March 30, 2010, Southern California Edison (SCE) informed Arizona Public Service (APS) of the company's intentions to divest its 48 percent stake of Four Corners Power Plant by 2016. According to APS, Southern California Edison announced it did not plan to sell its shares on the open market. Among the issues that may have prompted SCE to divest its interests are proposed legislative initiatives to regulate carbon from power plants, Best Available Retrofit Technology requirements for the plant by fall 2010, and the possible regulation of coal fly ash as a hazardous waste. In October 2010, the California Public Utilities Commission signaled that it would no longer allow investments at Four Corners Steam Plant after 2012, in compliance with SB 1368, the Emissions Performance Standard. The law, passed in 2006, prohibited new ownership investment in power plants that fail to meet minimum performance standard for carbon emissions. Southern California Edison owns 48% of two of the generating units at Four Corners. In November 2010 Edison International announced its intention to sell its share of the Four Corners Steam Plant to Pinnacle West Capital Corp. (PNW) unit Arizona Public Service Co. for the price of $294 million. Edison will sell its 48% stake in Units 4 and 5 of the plant, which at the time was still subject to approval from federal and state regulators in Arizona and California, Edison spokesman Gil Alexander said. 2005 Mercury Emissions: 563 lb. ↑ EPA Site Visit Report Coal Combustion Waste Minefill Management Practices, U.S. EPA December 13, 2001. ↑ "Environmental Groups Ask Feds to Require Reduced Pollution from Four Corners Power Plant", Jim Burnett, National Parks Traveler, February 19, 2010. ↑ "Air Quality: Request to clean up Four Corners timely", The Durango Herald, February 18, 2010. ↑ "APS closes 3 units at 4 Corners power plant," AZ Central, Dec 30, 2013. This page was last edited on 11 May 2015, at 19:03.